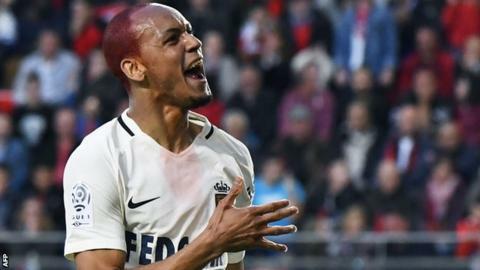 A move to Manchester United "would be very tempting", says Monaco midfielder Fabinho, who has been linked with the Old Trafford club. The 23-year-old scored 11 goals in 50 matches in all competitions last season as his side won the Ligue 1 title. United have so far added defender Victor Lindelof to their squad as they attempt to improve on last year's sixth place in the Premier League. "Manchester United is a great team and I would think about it," Fabinho said. "If [Manchester United manager Jose] Mourinho invites me it would be very tempting," he told Brazilian television channel Esporte Interativo. "But I would have to talk with my agent and Monaco to make the things right." Fabinho joined Monaco in 2013 on loan from Portuguese side Rio Ave and made his move permanent in 2015, when he also won the first of four caps for Brazil. But having claimed the Europa League, Mourinho is being linked with several players in order to build a squad capable of dealing with the added fixtures. Tottenham's Eric Dier and Nemanja Matic at Chelsea have been linked with a move to Old Trafford, as has Real Madrid striker Alvaro Morata. United have strengthened their backroom staff in hiring Juventus scouting manager Javier Ribalta, who was at the Italian club with Morata. Ribalta worked on deals for Dani Alves and Sami Khedira while at Juventus, who have secured six straight league titles.